Tank cleaning nozzles are used to clean, wash, and rinse every size container from small bottles and medium-sized drums to large railroad tankers. The tank cleaning pattern requires fluid to be delivered to the whole area of a vessel that needs cleaning. Typically this means a 360° delivery of fluid. There are 3 basic designs of tank cleaner that will achieve this: rotary jet cleaners for high impact, rotary fan cleaner for medium impact and static cleaners for low impact. BETE has stationary tank cleaning nozzles, rotating tank cleaning nozzles, and tank cleaning machines. More and more businesses are seeking vessel and tank cleaning equipment that is effective; and use less water and chemical. Bete and M-Series by Spray Nozzle Engineering deliver a large range of tank washers with excellent features to save costs and most importantly delivers great tank cleaning outcome. Choose from a range of different spray patterns: rotary fan solid stream, rotary jet solid stream, rotary flat fan, static multi nozzle, static spiral flow or spray ball; to find a suitable solution for your need. The latest tank washing innovation, M-Series Flow Step Technology by Spray Nozzle Engineering, also delivers exceptional results with less water and chemical. 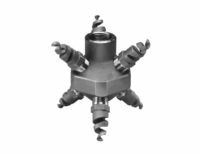 These patented nozzles release concentrated streams of higher impact liquid, delivering more efficient distribution, greater impact and faster clean-in-place (C.I.P) cycles.